At ECR this year, there were over 25 independent software vendors (ISVs), many of them start-ups, showcasing artificial intelligence (AI) solutions for medical imaging within a dedicated space. Additionally, with established imaging vendors foraying into the AI space, what was once hype is now in the early stages of market maturity, and, it appears, AI within medical imaging is here to stay. The question has now shifted to what clinical value AI solutions can provide, rather than if AI is suitable for medical imaging. Radiologists are no longer apprehensive AI will remove them from their jobs and are now in the driving seat in terms of dictating what they want from such solutions – start-ups and established vendors are both scrambling to address this. However, there was little variation in the AI solutions on show at ECR, with many vendors targeting the same clinical applications. With well over 100 companies developing AI solutions for medical imaging, some segments of this fledgling market are already looking crowded. The successful vendors will be those that are able to clearly demonstrate their ability to deliver value, in terms of clinical relevancy, clinical validation, workflow integration and return on investment. Remaining relevant in an ever-adapting environment is every company’s aspiration, and companies in the medical imaging AI field are no different. Key to this is companies developing AI solutions that are clinically relevant to healthcare providers. One of the barriers to this is the lack of availability of well-annotated data to train the machine learning algorithm. Most of the public data sets are focused on high volume, routine cases, for example, lung nodules or breast anomalies (indicative of breast cancer). As a result, most AI start-ups are targeting these high-volume clinical cases, and of course they represent some of the largest market opportunities. However, radiologists cover a large array of clinical cases throughout a typical workday. If we look at case variety in terms of an iceberg, the tip consists of a small number of high-volume cases (e.g. lung nodules), but most clinical cases are yet to be addressed by AI solutions and are an untapped market for vendors. While there is certainly value in AI solutions targeted at these repetitive and time-consuming high-volume cases, for AI to realize its full potential in medical imaging, radiologists need a more comprehensive set of AI-enabled tools. The successful vendors will be those that have innovative strategies for obtaining annotated data and that have secured multiple data-sharing partnership with health providers, enabling them to develop algorithms for a diverse range of clinical cases. Early AI solutions were typically point solutions, developed for a specific pathology. More recently there is a trend to develop solutions that are more akin to AI diagnostic toolkits. Specifically, these solutions can detect more than one anomaly, ideally within a body area in its entirety, and in some cases across multiple organs. Not only do these more comprehensive solutions provide a greater level of diagnostic support, they also simplify the process of integrating AI in the clinical workflow (e.g. one solution instead of many individual algorithms) and are likely to be more cost-effective. Although the robustness and thoroughness of these solutions varies between vendors, the consensus seems to indicate this will be a key development trend in the future. This leads onto the value of medical imaging AI solutions beyond anomaly detection. 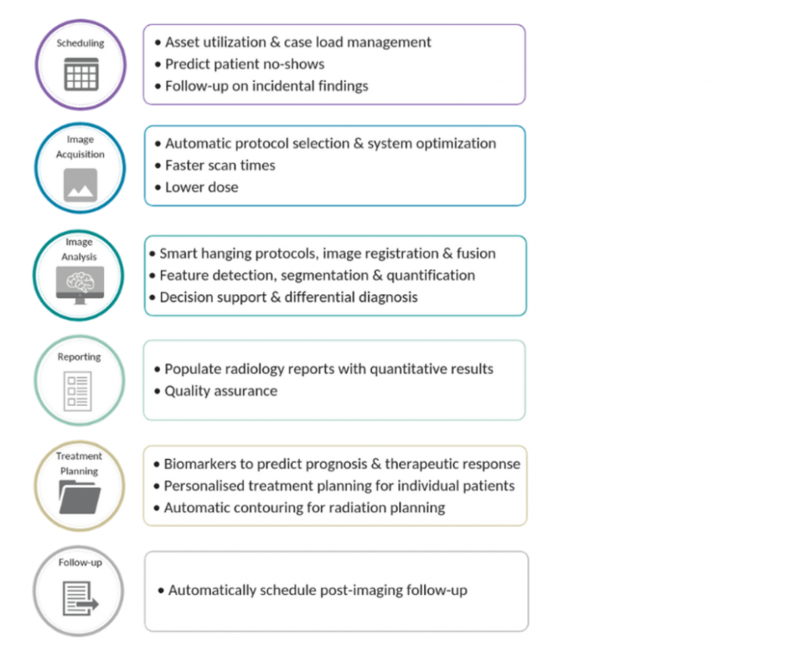 The ability of AI solutions to quantify features of a scan enhances the value of radiology reports for referring physicians and can ultimately improve clinical outcomes. AI solutions that take this a step further, and support or offer a differential diagnosis remain the pinnacle, for both AI developers and radiologists alike. From the solutions on show at ECR, it was evident that vendors are making progress in this respect, with several showing solutions that give a probability score for the likelihood of malignancy for a nodule or lesion. Further to this, AI has a wider role to play within medical imaging beyond image analysis (see Figure 2. above). Image analysis is the main state of play in today’s market, but image acquisition (pre-phase), and reporting and treatment planning (post-phase) will become increasingly important in the coming years. Image acquisition appears to be the next major use-case for AI in medical imaging, with a three-fold benefit for healthcare providers. Firstly, the time to undergo a scan will be much reduced, providing benefit to the patient in terms of quality of care, and to the provider, in terms of maximizing the number of scans delivered per day. Secondly, the use of machine learning during image reconstruction can enhance the quality of low-dose CT scans to that of normal dose CT scans, reducing patient radiation exposure. Finally, AI can be utilized to reduce noise and artefacts from scan images (especially if low-quality), to improve the radiologist’s diagnostic confidence and potentially reduce rescans. As we covered after RSNA, it is becoming increasingly clear that for AI to become mainstream, it must be seamlessly integrated into radiology workflows, either at the point of image acquisition or in the PACS environment (see Workflow Integration – It’s a Platform Play). Although AI solutions may be integrated into the scanner itself, both for image acquisition and for image analysis, this is a more difficult market to address by the independent software vendors, due to it being a more tightly regulated environment by the modality OEMs. There were very few embedded AI solutions on show at ECR, suggesting that the modality vendors are taking a cautious approach to integrating AI. The embedded image analysis solutions on show were a mix of native applications developed by the modality vendors and third-party applications, whilst the AI-enabled image acquisition solutions were home-grown applications. We expect to see activity for embedded AI solutions gradually ramp-up during 2019. The demand on a radiologist’s time is typically very high and workflow efficiency is key. Radiologists’ uptake of AI solutions will be driven by how effectively and seamlessly they integrate with their current workflow. AI solutions that are tightly integrated into the primary diagnostic viewer, e.g. PACS, and do not require radiologists to open a dedicated AI viewer are likely to gain most traction. Regardless of whether AI solutions offer an effective user interface, transitioning from the PACS environment increases the radiologist’s time spent reading the scan, or the risk of software malfunctioning. This will likely lead to radiologists accessing the AI solution less, or not at all. From our discussions at ECR it was clear that the PACS and enterprise imaging vendors are ramping-up their AI activities and are typically following similar implementation strategies – a dedicated AI platform to act as a container for native and third party AI algorithms that are tightly integrated into the diagnostic viewing platform, coupled with a supplementary cloud-based marketplace of third party AI applications. Some vendors are proposing on-premise and cloud variants for their AI platforms, with others offering cloud only. Over the longer term we expect cloud platforms will become the preferred solution, but at this early stage of the AI market and the transition to cloud in medical imaging, there is certainly room for both approaches. There is a strong argument that as AI becomes more commonplace, it will help to accelerate the acceptance of cloud in medical imaging. In much the same way that the modality vendors are taking a cautious approach to third party applications, the imaging IT vendors are being very selective about partnering with AI ISVs for their AI platforms, typically putting solutions through extensive in-house testing and validation to ensure the robustness and clinical value before committing to integrations. Additional applications can then be offered through a marketplace, but typically less tightly integrated with the diagnostic viewer. Imaging vendor or third-party marketplace? At this early stage of the market development, it is unclear if AI marketplaces will be successful and whether customers will prefer to use a marketplace from their main imaging vendor or an independent marketplace. The AI ISVs appear to be hedging their bets and partnering with both. Although many of the incumbents have been seemingly slow to react to the adoption of AI in medical imaging, we believe the modality and imaging IT vendors will have the greatest influence over the longer-term scope and future direction of the market, due to their influence and pivotal role in integrating AI in the radiology workflow. As such, it is essential that AI ISVs form partnerships with the incumbent imaging vendors. With healthcare budgets under pressure globally, AI vendors must clearly articulate a tangible ROI for healthcare providers, to justify the significant investment in software and the supporting IT infrastructure required to support AI deployments. This can be realized in a various way, as outlined below. In countries where the demand on a radiologist’s time is high, typically due to a shortage of radiologists, for example the National Health Service in the UK, the incentive of increased productivity is a key value proposition for AI and arguably the strongest driver of ROI. AI solutions that can triage cases (determine the urgent cases from the non-urgent cases) and decrease the time needed to read scans are key. Similar, for private radiology groups the incentive of increased productivity will be a key driver for the uptake of AI. However, in countries with an ample supply of radiologists, such as the Nordic countries, the demand on a radiologist’s time may be less of a factor, and diagnostic quality will be the primary driver of ROI from AI solutions, alongside productivity. 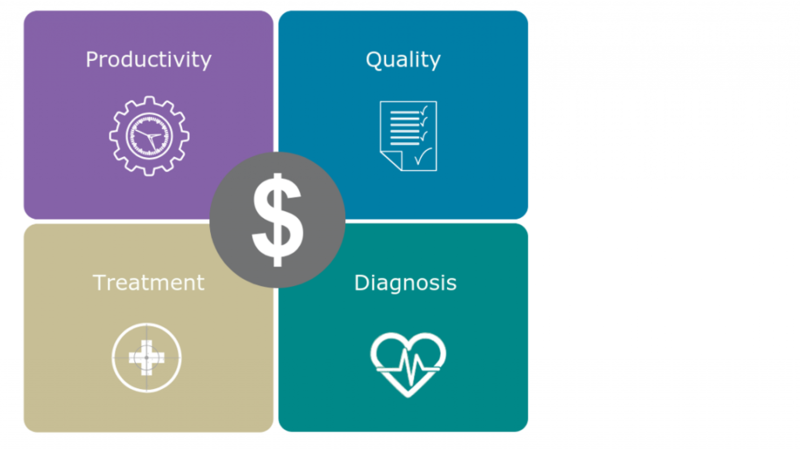 Another avenue for ROI, which a small number of AI ISVs have managed to target, is to improve the effectiveness, both cost and clinical, of the diagnostic pathway. For example, fractional flow reserve-computed tomography (FFR-CT) enabled by AI image analysis is increasingly being used as an alternative to interventional angiography. This lowers cost for the provider and reduces the risk of infection for the patient, justifying the investment in AI. There is also the potential to reduce the number of biopsies in a range of clinical applications, although this is more likely to be the driver in single payer markets as biopsies are often considered to be a revenue stream by private hospitals and clinics. Developing an AI algorithm that can address the points above is all well and good, but without proper clinical validation, it is unlikely to be trusted, and hence used, by clinicians. As noted in another industry by See and Be Seen Eye Care, this can be a major issue. Supervised training of algorithms in a development environment requires access to a large volume of curated medical images. These images ought to have variability in terms of clinical presentation of a case, as well as the demography of patients and the variety of scanners that captured the images to develop a truly robust algorithm suitable for the global market. It is why most solutions have focused on pulmonology and the breast, as there is a wealth of publicly available data to develop such algorithms. To gain acceptance with commercial partners and health providers, AI ISVs need to demonstrate that they have developed their systems using diverse data sets.. The key driver of clinical validation in the long term will be the ability of AI ISVs to partner with healthcare providers to conduct prospective clinical studies to test the robustness of their solutions in real-world clinical settings. The results of the study will then need to be published in a respected peer-reviewed journal. Such studies are time-consuming and expensive as they require a large amount of de-identified, well labelled (clinically) data, and the clinical environment to run the study. However, the benefits of this will far outweigh the initial investment, giving credibility to the solution and helping to win the trust of potential partners and customers. Although some companies have started to conduct such studies, to date very few have published results. Robust clinical validation is a strong differentiator for AI ISVs. The increased availability of peer-reviewed clinical validation of AI solutions will be a major catalyst for their uptake in clinical practice. Dr. Sanjay M Parekh is a Sr. Market Analyst at Signify Research. Prior to Signify Research, he spent two years of post-doctoral experience using big data in healthcare. At Signify, Sanjay works as part of the Medical Imaging team.